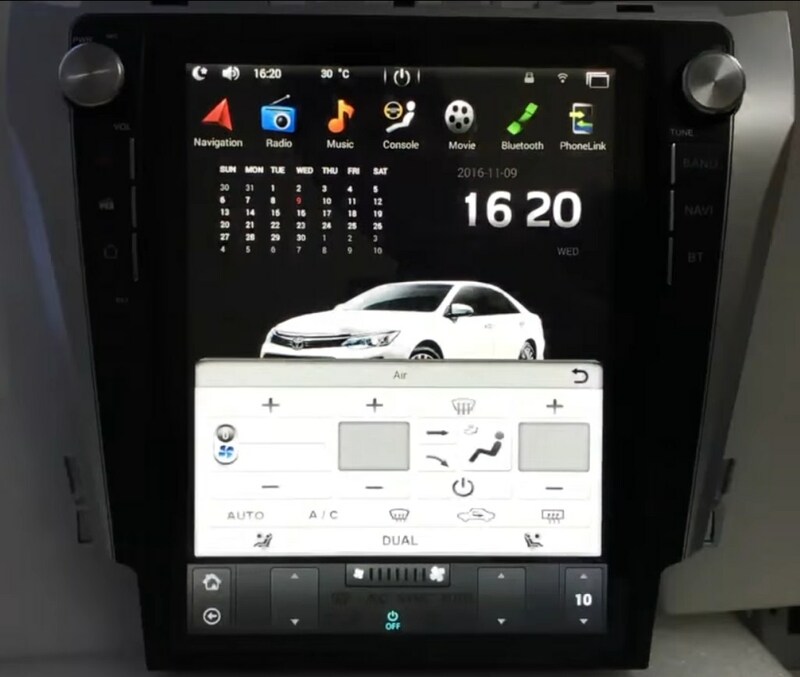 Today we are going to introduce a new series of Android head unit - Tesla Style unit with a large vertical screen. It is not by chance that its name is Tesla Style head unit. The fact is that the feature of the electric car Tesla - is a large onboard computer display. The hero of our today's review is made in the style of that car and also had a huge vertical screen. Setting the multimedia unit of this type is possible only on those cars where the toolbar leads to doing that. Toyota Camry V55 is an example of such kind of car. 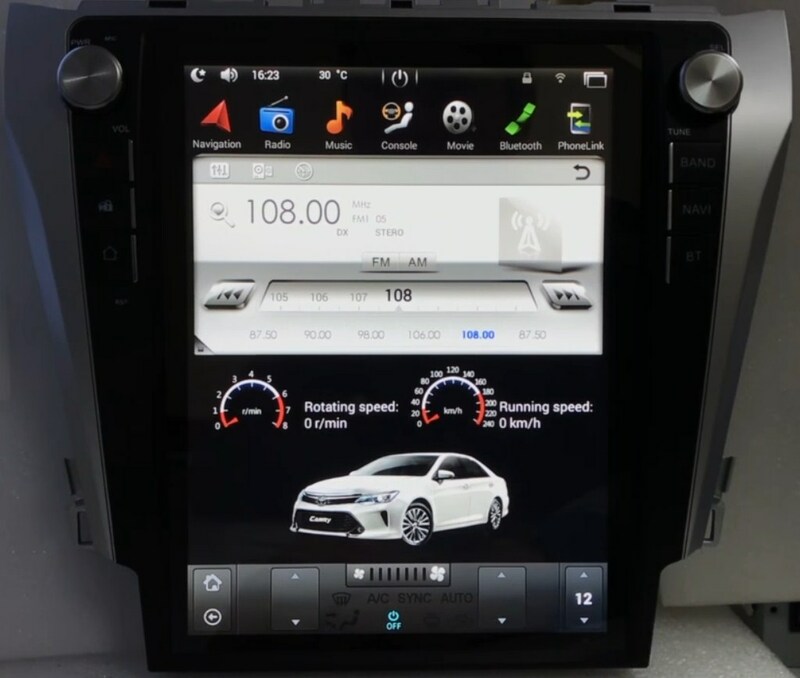 In this review, we will introduce you the new Tesla Style head unit, on the Toyota Camry’s V55 case. The shape and the execution of the frame and plastic of the head unit are perfectly fit the interior of the car. This head unit designs with buttons and controls that used for volume regulation and radio station searching. We need to notify that the DVD drive is missing in that head unit. We have sacrificed DVD for the big screen. Diagonal of the multimedia unit screen is 12.1 inches; it is IPS matrix with a resolution of 768 * 1024 pixels. That type of head units is available with a diagonal from 10.5 to 15 inches. The Head unit with those parameters inevitably copes with essential functions such as navigation, radio, music, Internet. Console (Console) – Thanks to this feature, you can configure the displaying and regulation of factory vehicle functions. PhoneLink – the duplication the screen of the phone to the display of the head unit. AUX - displays connected video devices. Settings – pressing this application icon is open the menu with various contexts. Here, you can choose the navigation program that runs when you click on the Navigation icon. Also in the settings, you can: select the language; adjust lighting; adjust the contrast and brightness of the screen; adjust the equalizer to your preference; customize the buttons on the steering wheel (this function is not supported on the Toyota Camry V55); reset to the factory settings; view system information, etc. App list application icon – is displayed all available applications of the head unit. System applications are shown on the left side of the window, uploaded and installed - in the right. DVR - additional video input that we need for a dash cam. In the bottom of the screen, we can see the climate control area. The factory climate control unit needs to be removing out wherein the corresponding plug is placing on the backside of the head unit. Clicking on any button of climate control opened an additional window with settings. You can change the location of that window in general settings menu. It can appear at the bottom or the top of the screen. We can display the applications on the entire screen, or minimize them to the half of the screen. When we reduce the size of the application, the information of tachometer and speedometer is showing in the bottom of the screen. The displaying of that information is possible thanks to wire that connects to the OBD connector. If you did not connect this cable, the performance of these meters would be static. The head unit has 2 USB outputs; a standard USB connector is also saved. This type of head units supports the A2DP protocol through which you will be able to listen to music from your phone via Bluetooth but play sheets, in that case, will not be available just a music stream. Our head unit supports voice control function; multi-tasking function, with which you will be able to use multiple applications simultaneously. So, if you like Tesla Style head unit - then do not hesitate and buy it. That head unit will surprise you with its features and every day will please its owner. 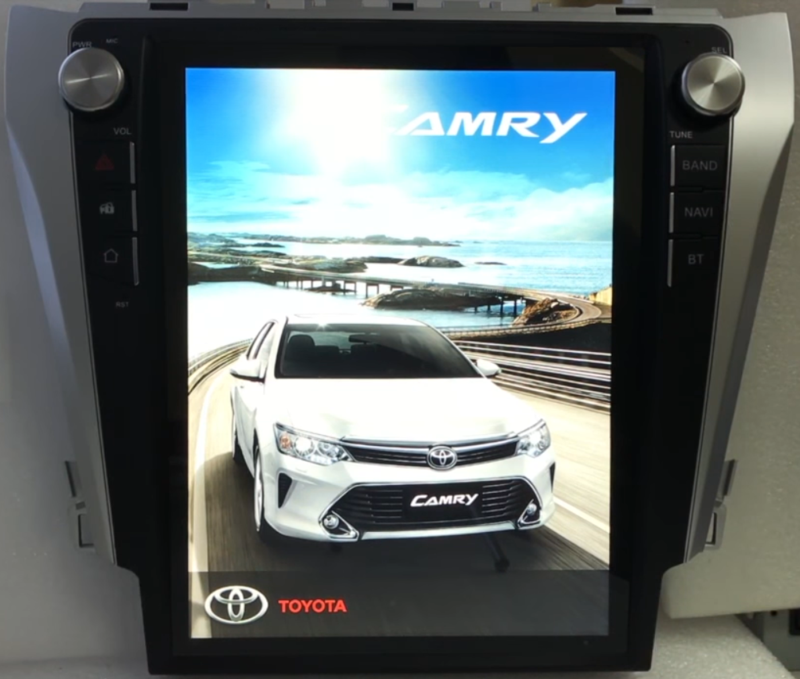 Do you have this head unit for Toyota Camry 2016. The SE Model and can you ship to Ghana. Hi, do you have for 2018 Toyota Prado? Hi. Do you have any plans for Mitsubishi Pajero 2015-17 considering that you already have a 12inch for the Pajero Sport? Thanks. How about a 2010 Chrysler 300s? Good afternoon, KT. Sorry, but we are not producing head units for Chrysler. Thank you for your interest in our products. Hi! Do you have a unit that will fit my 2006 Lexus GS300 (US model) with factory nav and factory Mark Levinsion? Good afternoon, Michael. Unfortunately, we are not producing head units for your car. Thank you for your interest in our products. What about one for the VW Touareg 1 (2002-2010)? The console has a lot of space and i'm very interested in one. I would like to get rid of the AC controls and heated seat controls. Therevis also a parktronic button there too. A nice big screen would be perfect. Thanks. Good afternoon, Joe. We are not producing Tesla style head units for your car. In case if we will begin such production in the nearest future, we will let you know. Thank you for your interest in our products. Good day, Henry, thank you for your question. If the information about the hybrid is describing on your factory head unit screen, or if the hybrid is connected to your head unit in some other way - that functions wouldn't be working after our head unit installation. Hi. I am building custom dashboard of my 100 series land cruiser. And I am a serious buyer. Can you please advise if you can make a panel compatible with 100 series Toyota landcruiser with working AC controls. Looking forward to a response soon. Thank you. Good afternoon, Mirza. Thank you for your interest in our products.